Within the pages of this creative nonfiction narrative are riveting supernatural God encounters beginning with a journey through the occult. 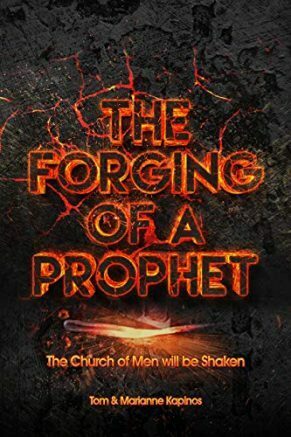 Tom and Marianne Kapinos of West Seneca, authors of “The Forging of a Prophet,” will visit Dog Ears Bookstore & Café for a book launch and signing event from 6:30 to 8:30 p.m. Friday, April 12. The nonprofit bookstore is located at 688 Abbott Road in South Buffalo. Married for 48 years and business owners in the window and floor covering business for the last 40 of those years, Tom and Marianne Kapinos are now semi-retired. They are blessed with two grown children — a married daughter who gave them two precious granddaughters and a soon-to-be married son. After hearing the call of the Lord, Tom and Marianne directed an outreach ministry and Christian Fellowship in Lackawanna. Part of that outreach included depicting the crucifixion of Christ. Traveling the local major highways and byways, their re-enactment was soon dubbed the “Living Billboard” by The Buffalo News and both Channels 4 and 7 in Buffalo. To learn more about Dog Ears Bookstore, please visit dogearsbookstore.org or call 823-2665. You can also follow the bookstore on Facebook for frequent updates. Be the first to comment on "Dog Ears Bookstore & Café to host book-signing event on April 12"